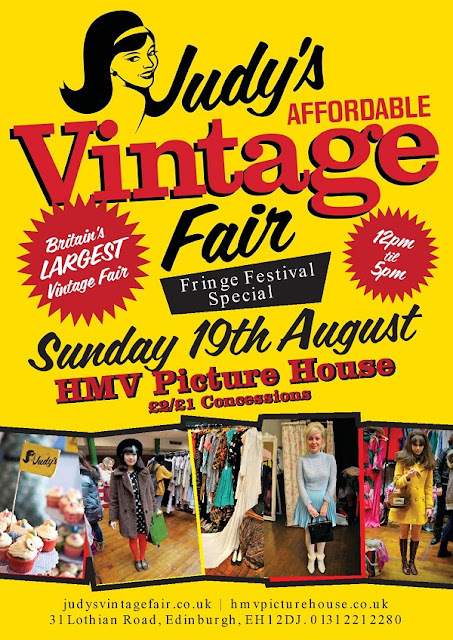 Judy's Affordable Vintage Fair (the UK's largest vintage marketplace, don't you know) is coming to Edinburgh this Sunday. It promises to be full of affordable, eclectic one-off stock, from 60s shifts & 20s lace (ooh) to tie-dye, menswear, accessories & more. The amazing Miss Dixiebelle (vintage hair & make up supremes) will be there, and I am going to go out on a limb and assume that there will be tea in vintage china & cupcakes galore. I've always had mixed luck with vintage shops/fairs. I own a very wonderful fake-fur coat that I bought in a theatre-closing-down sale for £10 which I love SO MUCH (even though I can't ever work out what to wear it with), but I've also spent many frustrating hours trying to find something that is nice, actually fits & doesn't cost £££s! Still, I like the sound of this one (they stress that it's affordable quite heavily, which hopefully means actually affordable, not just affordable in a "it's only £80, how maaaaahrvellous" way). If you aren't based in Edinburgh it's worth taking a look at their events page as they are all over the country (some have vintage furniture too, lovely!). Looks/Sounds like so much fun, shame it doesn't do it closer to me! I have always wanted to go to this but I am away home this weekend so will miss it again...boo! That looks like so much fun! I swoon over affordable vintage finds. Ahhh amazing! I always went to these when I lived in Leeds, so glad they're go to Edinburgh too as I'm moving there in a few weeks! The best one's to look out for are their 'Kilo Sales' - you pay by the weight of your clothes, £15/kilo, which is great when all you want are tshirts and dresses! Also I've always found they're pretty relaxed and if it's near the end of the day or you're extra nice to them they'll let you go over a kilo....once I got 2 kilos of clothes for the price of one!